Hi, My name is Desiree Habicht, owner of Desiree's Designs and the designer behind most of the products you'll find on our site. I've been dabbling in all forms of creative arts throughout my life, having been raised in an innovative home where my mother, a talented interior designer, created beautiful spaces everyday. For many years, I was fortunate enough to indulge my passion for painting fine art, murals, and faux finishes. 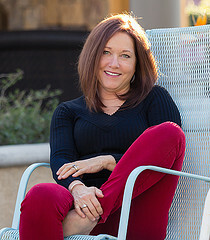 After my daughter was critically injured by a drunk driver in 2000, I reinvented my career, starting a home based pattern and design company that would allow me to make a living while caring for my daughter (a blessing that developed out of a tragedy). I love what I do and look forward to getting up every day. In addition to designing patterns, I also design fabric for Quilting Treasures, along with making and showing art quilts (yet another avenue to create art with fabric...I just love it). I still find time to paint and was thrilled to be published last year in several books and magazines. When I'm not working, I absolutely love being outdoors, whether I'm enjoying time in my organic vegetable and flower garden, going to the gym, taking walks with the family, or spending countless hours in the pool during the hot days of summer. There are so many blessings to count each and every day! I appreciate the people who help run my business and contribute to it's growth, without whom I wouldn't be able to accomplish much! My husband, Randy, learned the ins and outs of vectorizing and writing patterns, creating diagrams, and constructing quilts...he's the go-to-guy if you have any questions about the patterns or templates. 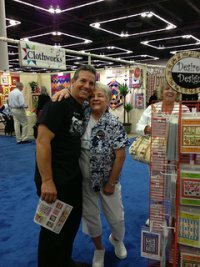 At quilt market, he's the eye candy at my booth, enjoying all the attention he gets from the ladies! As a team, we work hard every day to make Desiree's Designs the best it can be. My friend and office helper, Linda, is an organizer extraordinare, keeping all our patterns and products in order, and properly packaged, so we can ship your orders promptly and efficiently. 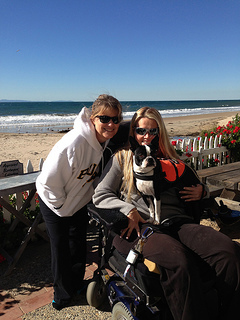 Here is Linda with our daughter Jennifer (at right) and her service dog, Chloe. I am always inspired and amazed by the people around me. They appreciate everyday, live life to the fullest, and never take anything, or anyone, for granted. Around here, I'm creating new designs and patterns everyday to support your passion for stitching! I'm happy to display your homemade items at a boutique, or as a fund raiser, provided you're not using my patterns for mass production or commercial use. Desiree's Designs supports many local organizations, giving back to a community that has given us so much love and support. We look forward to your continued patronage as our business moves into another exciting phase of growth and creativity. Please don't hesitate to contact me with any questions you may have... we're happy to assist you anyway we can!